The Oil States Houma pull-test facility provides a diverse array of high-load testing capabilities for testing offshore pulling equipment prior to deployment. A convenient location for load-in and out, the facility is strategically located on the bank of Bayou LaCarpe in Houma, Louisiana. Bayou LaCarpe flows directly into the Gulf Intra-coastal Waterway and provides a minimum of 12 feet of water depth from the Gulf Intra-coastal Waterway to the facility bulkhead. With 250 feet of bulkhead, our testing site is well designed for load-in and load-out of large, heavy equipment by either barge-mounted or land-based cranes. Test pit provides versatility for any testing scenario. Convenient location for load-in and out. 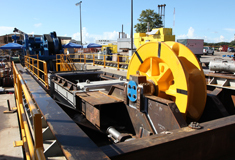 Complete pull-test capabilities with access to the Gulf Intra-coastal Waterway.